In a large bowl, combine ground chicken, onion, garlic, egg, chia, almond flour, half the salt, and black pepper. Form mixture into meatballs, about 1 1/2 inches thick. Melt remaining coconut oil in the pan over medium-high heat. Add meatballs and cook until browned, about 5 minutes. Transfer to oven and bake for an additional 20 minutes or until cooked through. Meanwhile in a medium saucepan, combine chicken broth, tomato paste, honey, apple cider vinegar, chilli powder, paprika, ground mustard and remaining salt. Bring to a boil then reduce heat and simmer for 5 minutes, stirring occasionally. Adjust seasoning if needed. Remove meatballs from the oven. 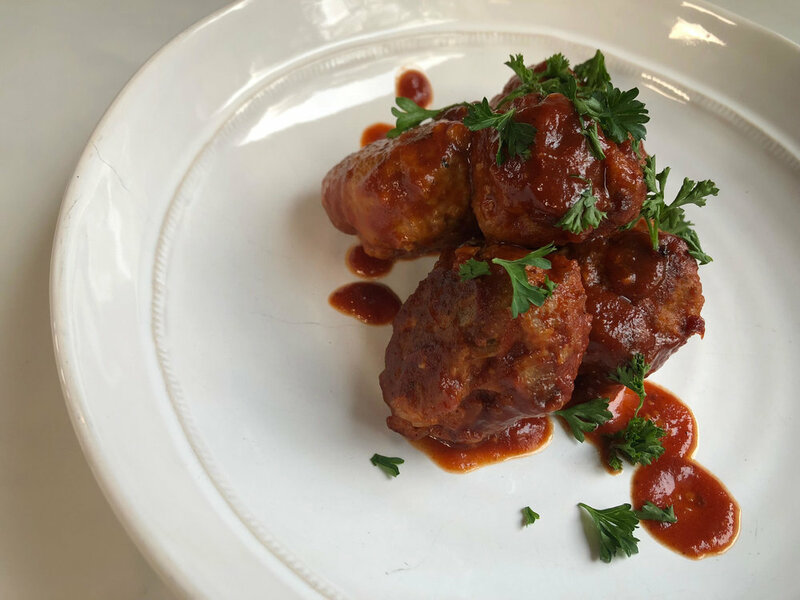 Evenly coat meatballs with sauce and divide into bowls. Top with chopped green onions or parsley if desired.